"RAVEN TOTEM" is the last of my "5 Easy Pieces" drawings. 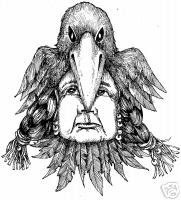 When I started this drawing, I knew I wanted a raven enveloping a person's head. I hadn't really pictured the person in my head - I just started with the raven. This is one of those drawings that just draws itself. Suddenly I'm finished and I don't remember doing the drawing. I love when that hppens! This drawing will be posted on eBay in a few days. Search "jgg" to find it.